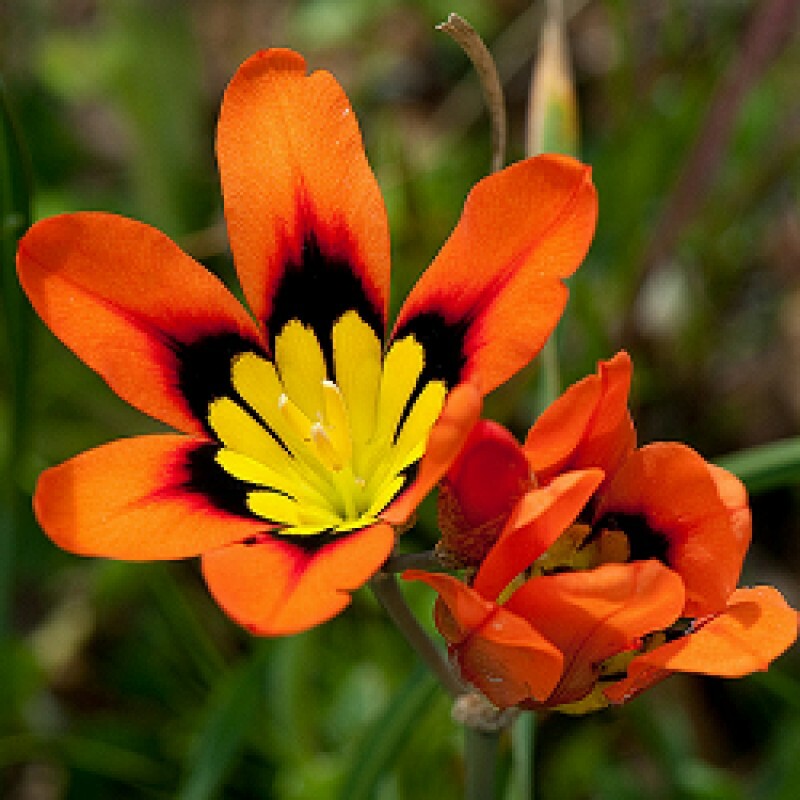 The harlequin flower is the most outstanding of its genus, Sparaxis, making very popular garden subjects. The genus of 6 species is among the most spectacularly patterned and colored bulbs native to South Africa. It is said that the effect of looking at a group of Sparaxis, or harlequin flowers, is like looking into a kaleidoscope. Growing from corms, harlequin flowers have sword-shaped leaves and tapered flower spikes of star-like florets in brightly-colored shades of yellow, rose, red, purple and even green. Another interesting species is Sparaxis grandiflora. It has yellow or purple blooms multicolored in pinks, yellows, reds and purples, all splashed with contrasting colors. Harlequin flowers are fairly hardy and easy to grow. They are early summer bloomers that perk up walkways and patios. Individual blooms do not last long, but flowers on the slender stems open successively from the bottom up, producing a long-lasting display that will look even more striking when planted close together in large groups. Harlequin flowers grow an average height of about 10 inches high. Use them as an accent in mixed beds and borders, rock gardens and containers. Harlequin flowers also make excellent cut flowers. During the growing season, the soil should be kept continually moist, especially after planting. Corms should be planted in the spring about 2 inches deep. Harlequin flowers prefer full sun in humus-rich sandy soil, but a semi-shaded site will also produce excellent results. Harlequin flowers will also thrive well in relatively poor soil. Little Sparaxis plant care is necessary with these flowers. In wet summer gardens, the corms are best lifted and stored but in well-drained areas, they can be left in the ground. Some species of the genus are not cold hardy. So if you live in colder regions, dig up the corms and store them before the first frost. The corms multiply rapidly if well watered throughout the growing season. Seeds can be sown in autumn and will flower the second spring or the offsets can be divided during dormancy and replanted.